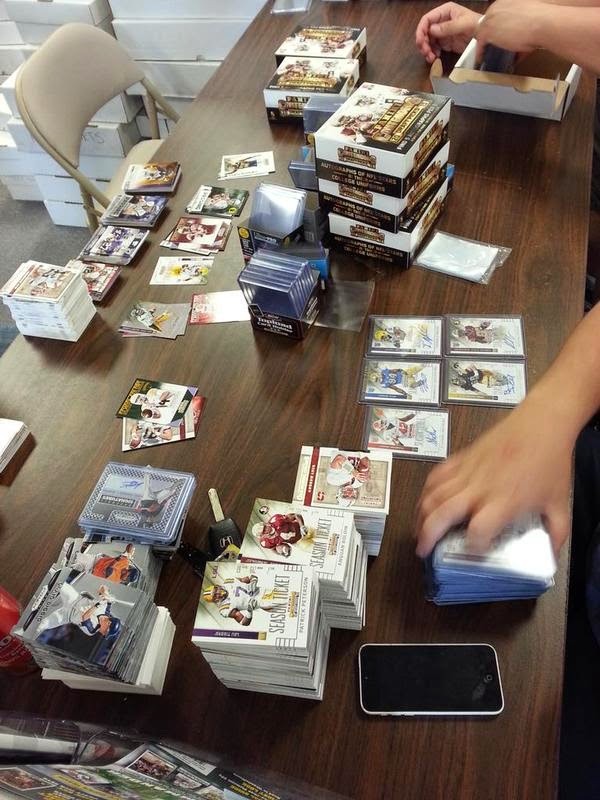 The guys met the arrival of 2015 Contenders Draft Picks Football ($130 per box) on Wednesday. 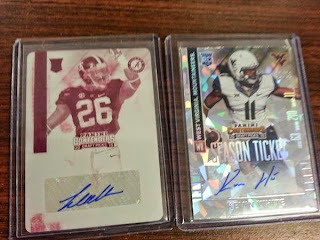 Panini's first product under the collegiate license is full of autographs (every box we saw opened had 6 or 7 autos), parallels, variations, and inserts. And, it didn't take long for the Super Hits to come off the assembly line at The Super Hit Factory. Year after year, Panini's Contenders Football formula has resulted in the most collected cards in the hobby. Every year we meet "Master Set" collectors who choose Contenders to chase every card produced in the product (down to their chosen level of parallels, base & variations, #d/99 or Cracked Ice #d/23). For Personal Collection (PC) collectors, what a way to dive into the 2015 football season. Variations, parallels and inserts of all your favorite players and college teams. PC collectors will find 2015 Contenders Draft Picks Football the challenge you look for in a product. With 6 or 7 autographs per box (approximately 75 autos per 12 box case) and a 175 base autograph set (excluding variations) means on the average, a case should deliver 5 out of the most valuable Draft Picks : Marcus Mariota, Jameis Winston, Kevin White, Amari Cooper, Todd Gurley, Devante Parker, Melvin Gordan, Nelson Agholor, Breshad Perriman, Philip Dorsett. Click HERE to see the possibilities. Also included in 2015 Contenders Draft Picks Football are autographs of current super stars and all-time greats. Look for Peyton Manning, Aaron Rodgers, Tom Brady, Andrew Luck, Russell Wilson, J. J. Watt, Drew Brees, Odell Beckham, Teddy Bridgewater and tons more. Whether you love college football, looking to fill your PC with amazing cards or looking for the challenge of completing a Master Set, 2015 Contenders Draft Picks Football is for you. So go to Sports Cards Plus TODAY and pick your box from The BEST CASES in The Hobby at The LOWEST Price ($130) in The Galaxy (all of Texas). And, while your here, your every purchase gets you a FREE entry to our $500.00 Drawing.